Richness of Indian culture is not seen only in India but outside India too. 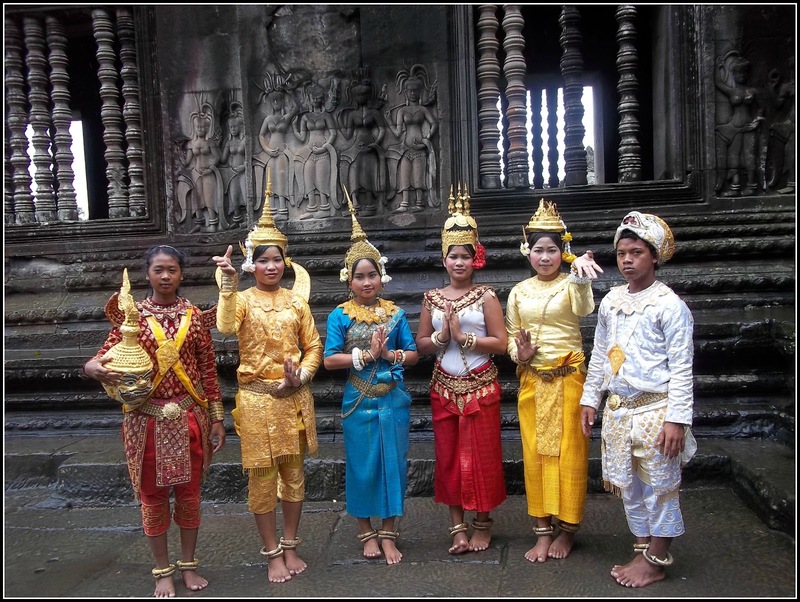 Not many know that in Cambodia, Siem Reap city is famous for its Hindu and Buddhist temples. We normally like to go for offbeat place for our vacations. This time we went to Ho Chi Minh City in Veitnam & Siem Reap in Cambodia. 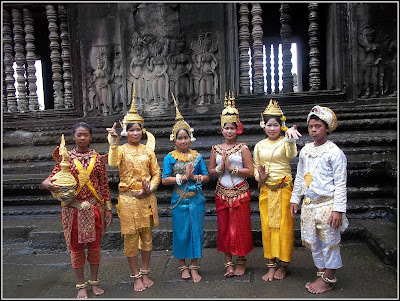 In this post I will write about Siem Reap in Cambodia. Siem Reap is a beautiful and charming city. It is land of temples and most people come here to check out the temple of Ankor Wat. 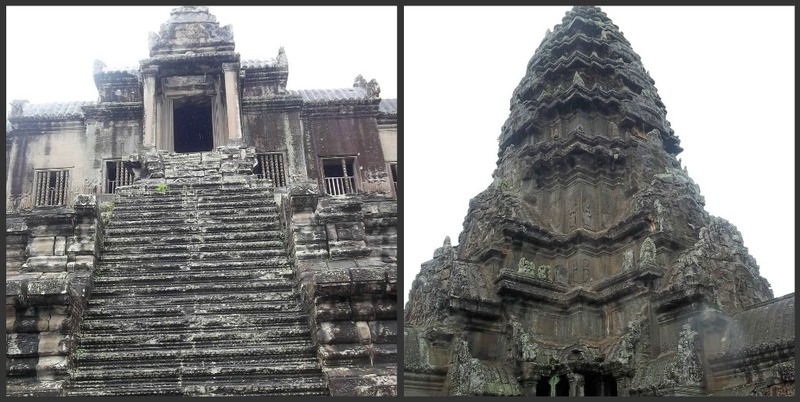 Angkor Wat is one of the most beautiful and fascinating places on the planet. Made by the Khmer kings in a process that lasts almost 4 centuries, this magnificent area has been abandoned and hidden by the forest. Re-discovered by French about 150 years ago, Angkor Wat is ready to become one of the most visited archaeological and artistic sites on the planet. The local language of Cambodia is Khemer. The local currency is Riel. US dollars are as commonly used as Riel. There are more than 50 temples in Ankor Archaeological Park, but we could visit only 3 temples in one day. 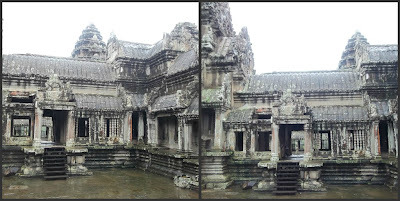 I will write about Ankor Wat Temple in this post. One must possess an admission pass (an 'Angkor Pass') to visit the temples and sites in the Angkor Archaeological Park. Passes may be purchased at the main entrance on the road to Angkor Wat. Passes are sold in one-day ($20), three-day ($40) and seven-day ($60) blocks that must be used on consecutive days. Photo taken on the spot with free of charge is required at time of purchase. Ankor Wat is surrounded by a moat. Walking across the causeway over the moat towards the temple is quite an experience. The temple is 1 km square and consists of three levels surrounded by central tower. At the outer wall, there is 3 meter statue of Vishnu carved from one sandstone block. The walls of the temples are covered with carvings & bas-reliefs depicting stories and characters from Hindu mythology. Bas-reliefs include the epic of Ramayana, the classic “Churning of the Ocean milk”. The visual impact of Ankor Wat is awesome. As one pass through the outer gate, its size and architecture make it appear two dimensional. After one cross through the gate and approach the temple along the walkway it slowly gains depth and complexity. The temple interior is not as densely carved as the first level exterior, but still sports hundreds of fine carvings of apsaras and scenes from Hindu mythology. At the upper most of the temple the central tower on the third level houses Buddha images, each facing a different cardinal point. Some say it is good luck to pay homage to all Buddha images before departing Ankor. Nearly 1000 distinctively rendered apsara carvings adorn the walls throughout the temple in dancing mode. The linga, the naga multi-headed serpent, the garuda are seen in the temple. Wow!!!! This could have easily passed off as Indian temples!!!! amazing!! !